Sure, quazi-neutrality is violated in "local regions", but the scale size that you are talking is on the order of about 10m in the solar wind, so for all intents and purposes, yes, you can think of it as a quazi-neutral plasma. For averaged solar wind samples, sure. For "Hot Flow Anomalies", not so much. and "Hot" means a lot. I appreciate your time & effort to participate and answer questions in this forum. Please, however, allow me a preamble, introductory statement, before providing the question & answer. The presence of Double Layers and their physical dynamics in space plasma is a central thesis & proposition of this forum and when analyzing & interpreting astrophysical phenomenon, to arrive at a complete understanding of such astrophysical phenomenon, the identification of Double Layers is a first order of analysis & interpretation. Indeed, the Electric Universe Theory, as a whole. rises or falls on the thesis & proposition that Double Layers are a wide-spread and common phenomenon in astrophysical plasmas. The idea that Double Layers are wide-spread and common phenomenon in astrophysical plasmas was first proposed by Hannes Alfven, the 1970 Nobel Prize winner in physics for his work on magnetohydrodynamics (MHD). Anaconda wrote: Does your paper recognize and discuss that where seperate bodies of plasma, with different physical properties, collide, a Double Layer will form? ... So, double layers form when you get areas of charge separation, so the ionosphere, for example, where the ions can penetrate further than the electrons. However, the solar wind is basically quasi-neutral (equal numbers of electrons and ions), so you won't see anything like that on large scales. In brief, the formation of Double Layers do not depend on pre-existing charge seperation, rather, Double Layers form where bodies of plasma collide and, in turn, cause charge seperation, and, thus, segregated currents of electrons and ions. Double Layers are the cause of charge seperation, their formation does not depend on a pre-existing state of charge seperation, but, rather, on the collision of plasma bodies with different physical properties -- charge seperation can be present, but is not a necessary prerequisite, for the formation of Double Layers in astrophysical plasma. And, given the above preamble, it is important to state in precise terms why I disagree with your answer. In regards to quasi-neutral plasma, it is important to remember, while the plasma has equal numbers of electrons & ions, it is still an ionized or an electrified body. Coulomb force is present among the free electrons & ions in a body of plasma. Wikipedia entry wrote: Coulomb's law or Coulomb's inverse-square law is a law of physics describing the electrostatic interaction between electrically charged particles. Coulomb force is present in all plasmas -- or, in fact, it wouldn't be a plasma, but instead a body of neutral gas. In other words, colliding bodies of plasma, yes, colliding quasi-neutral bodies of plasma, cause Double Layer boundary sheaths to form, which, then, in turn, causes the segregation and acceleration of charged particles, which are segregated into bodies of electrons & ions, thus, segregated electric currents. Who is Dr. Anthony L. Peratt? Peratt biography wrote: Anthony L. Peratt (S'60, M'63, SM'85, F'99) received his Ph.D. in electrical engineering in 1971 from the University of Southern California, Los Angeles. Earlier degrees include the MSEE, USC, 1967; UCLA, 1963-1964, BSEE, California State Polytechnic University. He was a Staff Member at Lawrence Livermore National Laboratory (1972-1979); a Guest Physicist at Max Planck Institut für Plasmaphysik, Garching, Germany (1975-1977); a Guest Scientist, Alfvén Laboratory of the Royal Institute of Technology in Stockholm, Sweden (1985); and, at Los Alamos National Laboratory from1981to the present serving in the Applied Theoretical Physics Division, Physics Division, Associate Laboratory Directorate for Experimental Programs; and as Scientific Advisor to the United States Department of Energy (1995-1999) where he served a term as Acting Director, National Security, in the Nuclear Nonproliferation Directorate. Anthony L. Peratt understands the physical dynamics of space plasmas and how Double Layers form in astrophysical plasmas. Let's take another look at Dr. Peratt's statements. The so-called "bow shock" more accurately described as the collision point between a planet's magnetosphere and the solar wind, sets up a magnetic field which is perpendicular to the motion of the solar wind. So, when the solar wind collides with this magnetic field a Double Layer sheath boundary is formed. Definition: A double layer is an electric charge separation region that forms in a plasma. It consists of two oppositely charged parallel layers, resulting in a voltage drop and electric field across the layer, which accelerates the plasma's electrons and positive ions in opposite directions, producing an electric current. Large potential drops and layer separation may accelerate electrons to relativistic velocities (ie close to the speed of light), and produce synchrotron radiation. Double layers may be found anywhere that plasmas are found, from discharge tubes to space plasmas to the Birkeland currents supplying the Earth's aurora. And although plasmas are highly electrically conductive, a property that tends to neutralised charges, double layers may self-generate, or form when two plasma regions with different properties come into contact. The physics of double layers are also utilised to produce ion thrusters, such as the Helicon Double Layer Thruster. More at http://en.wikipedia.org/wiki/Double_layer. See also Nicholson, Dwight R. _Introduction to Plasma Theory_, Krieger Publishing Co., Malabar, FL, 1992. The physical properties of the Electromagnetism in plasma are scalable to at least 14 orders of magnitude. In other words, what has been demonstrated in the laboratory can be applied to astrophysical plasmas. Dr. Peratt's above quoted statements taken together have been fully tested and confirmed in numerous plasma laboratories. Therefore, glyn_collinson, your answer, in brief, "However, the solar wind is basically quasi-neutral, so you won't see anything like that [Double Layers] on large scales. ", is wrong. I know you want to understand the physical dynamics of Hot Flow Anomalies, however, with due respect, you will not fully understand those dynamics, if you don't fully understand the dynamics of plasma, first. That understanding can be gained by fully understanding how plasma behaves in the laboratory -- it's dynamics are well understood both qualitatively and quantitatively from the work done in plasma laboratories -- and because plasma dynamics are scalable those understandings can be applied to astrophysical plasmas. I would like to continue the discussion. Given the above discussion of electromagnetism principles in plasma environments, it seems well taken to conclude colliding bodies of plasma, yes, quasi-neutral plasma, do lead to the formation of Double Layer boundary sheaths in the astrophysical environment, including the interplanetary environment, such as was studied in this paper. With all due respect, your team's paper, in my opinion, is flawed by this basic misconception of how space plasma behaves. I'm fairly certain that the HFA is not 2 dimensional, as per the illustration. Would it be reasonable to consider the 3d event as being a vortex? We see the vortex at all scales, so would it not be reasonable to think that they also exist in the plasma layers further out, at larger scales? Double Layers are a wide-spread and common phenomenon in astrophysical plasmas. Hertz, you've basically got it. Double Layers need there to be some sort of charge separation, and the length-scale that this kind of physics is important is only about 10m in in the Solar Wind, and only 100m in the super-heated Earth's Magnetosphere, and we're talking about structures that are hundreds if not thousands of times larger, so these kind of small-scale processes are essentially insignificant when compared to the big picture of what's going on. An absolutely top question. Yes, these are 3D structures, but I'm not sure the word "vortex" is quite the right imagary, because that suggests like a tornado or something. It's more like a filament or finger of hot plasma that sticks out from the bow shock and expands rapidly. There have actually been some recent simulations that look at HFAs out at the edge of the heliosphere, way beyond the orbit of Pluto. 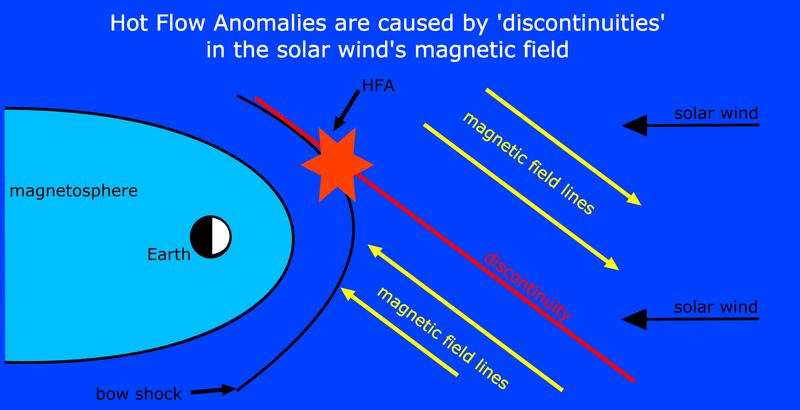 There are a bunch of criteria needed for an HFA to form, one is you need a discontinuity in the solar wind, another is a standing magnetic bow shock to reflect particles, and then you need the local electric fields to be pointing towards the discontinuity on at least one side. So, so one of the take-home messages of my paper was that since we've seen them at the Earth, Saturn, Mars (probably), and now Venus, they're likely a universal plasma phenomena, found not only throughout our Solar System, but the whole universe! glyn_collinson wrote: However, I just haven't seen anything that event suggests a Double Layer in my data. Well, then I suggest you aren't looking very hard. ACE News wrote: The SWEPAM and MAG experiments on ACE have now obtained the first direct evidence for such merging and disconnection from the Sun. Check out the link and the schematic in the body of the report. Notice the location where it is claimed there is a "Reconnection Site". A location before the solar wind impacts any planet (at least as far as I can tell). I suggest the location on the schematic where it is labeled "Reconnection Site" is actually an electric Double Layer. Does the schematic location labeled "Reconnection Site" look like the following written description? 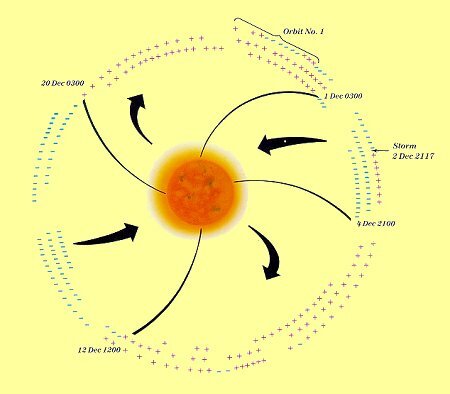 The moving solar wind with its attendant magnetic fields harbors discontinuities, areas where the magnetic fields change direction, sharply and abruptly. You do review the ACE satellite news reports, don't you? In fact, as you should well know so-called "magnetic reconnection" has been observed & measured in various locations within the interplanetary medium. It's the position of most members of this forum who subscribe to the Electric Universe Theory that so-called "magnetic reconnection" is actually the Double Layer electromagnetic phenomenon that has been erroneously labeled. I, so subscribe, after long and thoughtful research & analysis of both the Magnetic Reconnection proponents' facts, evidence, and arguments, and the Double Layer proponents' facts, evidence, and arguments. Also, if you have been taught that Double Layers don't exist in astrophysical plasma (except in very limited circumstances such as the ionosphere in connection to the aurora) then you won't even go looking for it or expect to find it. Might not recognize it even if you saw it. In truth, mainstream astronomy was slow to acknowledge the Double Layer in the ionosphere/aurora until satellites where able to measure the electric field and it became impossible to deny any longer. Even today, with the advanced satellite probes it is still difficult to measure the electric field because it can not be observed & measured at a distance, like can be done with a magnetic field, but, rather, a langmuir probe must be physically inserted into the area of investigation to observe & measure whether an electric field is present. glyn_collinson, your answer is not responsive, frankly it's rather flippant. I take your answer to be implicitly saying, "If a Double Layer was there, I would have found it. Therefore, I don't have to respect or 'grasp the nettle' of your arguments." Sorry, I don't buy it and think it's disrespectful to ignore my arguments with what amounts to non-responsive brush off. 1. Plasma physics has been demonstrated in the laboratory to be scale independent up to at least 14 orders of magnitude. 2. There is no evidence to support the proposition that while plasma physics is scale independent, Double Layers are scale dependent, therefore, Double Layers can not exist in large-scale astrophysical plasma. 3. Double Layers have been scientifically confirmed in near-space in the ionosphere/aurora. Now, as I stated before, I appreciate your participation in this forum, but it seems also appropriate for you to "grasp the nettle" of my arguments, the facts & evidence I cite to support my argument, since the presence of Double Layers and their physical dynamics in space plasma, including the interplanetary medium, is a central thesis & proposition of this forum. It does not advance the interests of this forum for you to ignore reasonable discussion based on a central premise of this forum. Please take the time and answer my question by responding to the evidence I cite. I look forward to your response. Well now folks, I've just had a chance to read through this thread, and it's frankly dismaying to see the performance of StalkingGoogle in response to a constructive conversation begun by Glyn Collinson. I note also that private messages from administrator Dave Smith to StalkingGoogle have been entirely ignored. Thanks to the alertness of the moderators, StalkingGoogle has now been banned. It seems that some folks can have great difficulty seeing a positive development for what it is. Yes, it's been shown repeatedly that conversations with zealots will go nowhere. But when scientists, working with commonly accepted theoretical frameworks, are open to engaging us dispassionately, where's the basis for attacking the individual? I can see a number of theoretical issues here well worth a studious review, including the size of various "islands" within which electric currents are now acknowledge to exist. The bigger the islands get, the more essential it will be to look at the boundary conditions to see if a particular island is actually, well, an "island" at all. Perfect example: IBEX, and the investigation of the heliospheric boundary. IBEX alone has delivered back to theorists a resounding answer to prior models: the models failed to predict what has been found—charged particle interactions between the heliospheric island and interstellar space. The idea of a heliospheric island is no longer supported by fact. That is a repeat of prior FACTUAL extensions of the "electric universe," as when the magnetospheric "island of earth" was removed by the discovery of the Earth-Sun electrical circuitry, with charged particles from the Sun rushing through the magnetospheric "boundary" to light auroral displays. Consider this, for example: the "open" magnetic field lines of the Sun don't close within the heliosphere. But magnetic "field lines" always close. Hence there's no escaping the Sun's presence within a larger (galactic) flow of charged particles, creating the interstellar scale of field lines exhibited by the "island" of the Sun. All of the electrical attributes of the Sun we've discussed over the years point to the very role of "boundary-less" electrical influences that the open field lines confirm as well. So much room for constructive discussion here. Everyone please respect the value of a dispassionate exchange with Glyn. I owe you an apology because I was a little rough on you. I'm sorry. After going over the material presented on this board and additional outside research, I realize your project was limited primarily to determine whether Hot Flow Anomalies existed where Venus's atmosphere/ionosphere and the solar wind came into contact. Your project was not designed to determine the specific physical processes and dynamics as such. I understand the satellite probes, the observation & measuring instruments, available to your team's project weren't designed specifically for your project and, therefore, had limited capabilities to observe & measure the phenomenon at Venus's atmosphere/ionosphere contact with the solar wind. In essence, you were "making do" with the instrumental resources available. Just to determine whether or not Hot Flow Anomalies existed at Venus was an accomplishment in itself. So, with the above in mind, I simply hope you keep an open-mind regarding the physical principles I discussed. I know I'm an anomymous participant with a web handle for a identifier, on a website which challenges conventional viewpoints, but keep in mind Dr. Anthony L. Peratt and Hannes Alfven and, today, there are other public scientists who are actively investigating the priciples I have discussed. I hope you take it under advisement, if you will, and, perhaps, in the course of future research, you will keep an eye open for the physical signature of the presence of Double Layers. I realize that for you as a post graduate, relatively new researcher, "taking names and kicking tail" isn't the way to advance in the profession. I also realize it's important to "play & work well with others" within the community. That doesn't mean you can't internally take note when you observe phenomenon which is consistent with the signature of a Double Layer and follow those observations with additional investigation. Who knows, maybe one day, with accumulated scientific evidence, you will have the confidence born of hard won observational analysis & interpretation to support a peer-reviewed paper which will be published in Nature or Science regarding Double Layers and you could be part of the process of changing the paradigm. And, if the timing was right, with the 'community' intellectually prepared to accept it, subscribing to this idea would be great for your career. Thanks, again, for participating on this forum. Good luck with your future endeavors -- and keep reaching for the stars! The interplanetary magnetic field makes a spiral pattern as the Sun turns. Pie-shaped "sectors" between the curved black lines are regions where the magnetic field has a consistent direction, its lines of force pointing either away from or toward the Sun ----The boundary between the two magnetic hemispheres consists of a thin neutral sheet, in which the magnetic directions are not consistent. The neutral sheet is slightly warped, so that it does not lie quite flat in the plane of the Earth's orbit. As the Sun rotates, the sheet turns too, so that the Earth is alternately on one side of the warped region and the other. As this happens, satellites near the Earth observe the change in the direction of the interplanetary magnetic field as the sector boundaries pass the Earth. Are these sector boundaries the discontinuities ? Uniquely, the HFA was captured on both sides of the bow shock; THEMIS-A was upstream, in the solar wind, and the other THEMIS spacecraft were in the magnetosheath. Furthermore, the THEMIS ground-based observatories saw the impact of the HFA on the magnetosphere. Thanks Glyn. I'm wondering then how an SFA differs from the vortices observed by Cluster? I would think the same principles would apply to all bodies with plasma boundary layers. The 'bow shock' would seem to be a plasma boundary layer, would it not? In the presence of a driven plasma flow along the magnetopause, the Kelvin-Helmholtz instability can develop, leading to the formation and growth of plasma vortices in the boundary layer. Venus Transit- Plasma tail & Coronal Hole? At the moment we have a coronal hole on the Sun which is said to interact with Earth on June 5th-7th. Unfortunately, the Earth in it's elliptical orbit is near it's furtherest point from the Sun in June. If the transit were in January then I would get excited, but as it is the Venus-Earth distance is an extra 3 million Km now compared with January. moses wrote: Unfortunately, the Earth in it's elliptical orbit is near it's furtherest point from the Sun in June. If the transit were in January then I would get excited, but as it is the Venus-Earth distance is an extra 3 million Km now compared with January. true, but perhaps a M3.3 combined with the CH will do it?